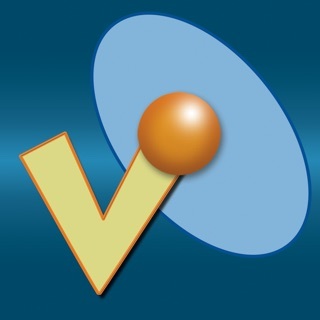 VowelViz Pro takes the innovative speech mapping app, VowelViz, and makes it even more FUN! VowelViz Pro implements fun, new themes, flash cards, and Vocalic R View to help further engage students in speech therapy! Let your students control the UFO and Bee voice trackers and get them in the correct target ranges. 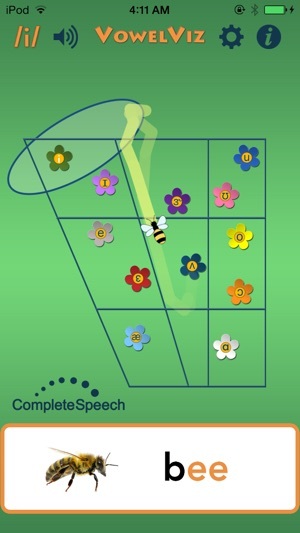 Flashcards provide words and images associated with target vowels and R. The real-time, interactive feedback from VowelViz Schools helps students practice target vowels and R accurately and consistently. 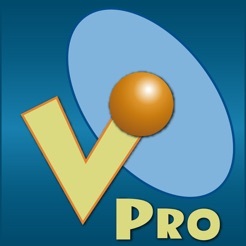 VowelViz Pro includes the Vocalic-R View, which allow users to focus on properly producing the English "R" sound. The Vocalic-R view includes easy to understand, spelling-based letter to help therapists, parents, and students to understand how to pronounce vocalic R's correctly. VowelViz is an innovative speech mapping tool that displays vowel production in real-time. 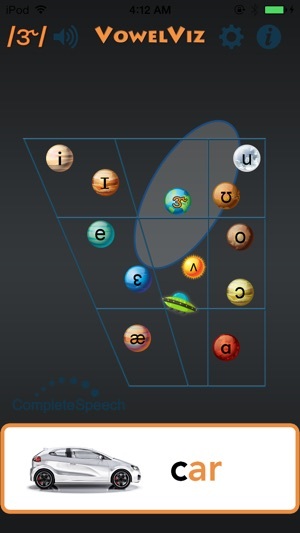 With applications in speech therapy, accent reduction/second language learning, and home practice, VowelViz is a versatile and easy to use tool for practicing vowels. VowelViz provides a fun and engaging foundation to practice clear and consistent vowels, without guessing, in order to develop and strengthen muscle memory effectively. The app’s display is designed around the vowel quadrilateral and existing research on average vowel formants. When voicing is detected, an orange ball plots the position of the sound on the screen, presenting an easy to understand visual representation of the vowel. By tracking the movement and position of speech over time, learners can better visualize the movements needed for clear and distinct vowels. This understanding provides the framework to practice making those distinctions clear and precise. 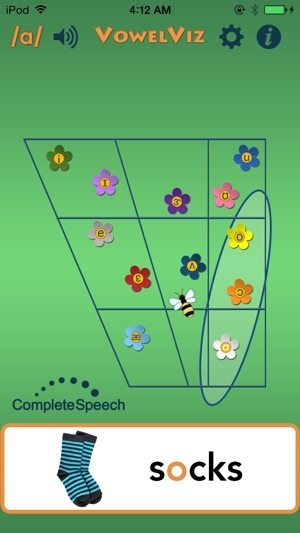 The vowel quadrilateral display shows learners where vowels are produced within the mouth. By moving their tongues up and down and forward and back in their mouths, learners gain control of their speech as they hear, feel and see the differences in sounds. 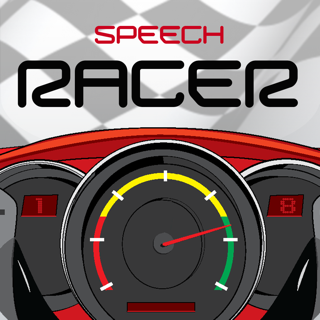 This control allows them to find target vowels and practice them repeatedly until they become natural and fluent in their speech. Quadrants within the vowel quadrilateral act as relative targets and help users orient themselves to where in the mouth they should be producing the vowel. Learners are also able to see how their vowels compare with the researched averages of others. These averages are represented in the app as ranges around each vowel that can also function as relative targets for learning or improving vowels. VowelViz provides a platform to transition from simple to more complex speech. In addition to isolated sounds, it can be used to see and practice dipthongs, blends, and even words and phrases. An adjustable tail can be added to VowelViz’s speech tracker to increase understanding of how combinations of sounds work together to form words and other complex speech. The longer the tail, the more clear the connection between sounds. 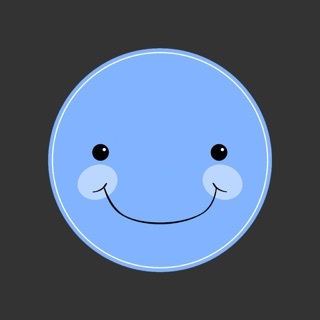 VowelViz is designed to be simple and easy to use so that anyone can practice clear, consistent vowel productions. The app is equipped with step-by-step instructions on how to use the various features and options. 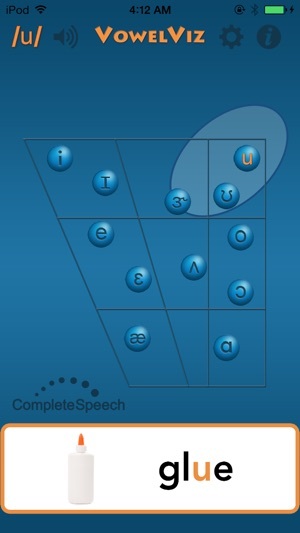 Also included in the app are diagrams, charts, and descriptions of IPA, the vowel quadrilateral, and vowel formants. Anyone who is unfamiliar with these terms can quickly learn to use VowelViz without any misunderstanding of the terminology or technical aspects used in the app. Fixed glitch for some devices. I'm an adult SLP grad student with no history of any articulation impairment. For this app I can produce R sounds that cause the orange ball to hit the target area on the screen. However NONE of my FRONT vowels hit their targets (those on the left side of the quadrangle). Please adjust and push through an update on this!! Won't be able to use for vowel activities with students. Thanks for the R interface though, quite nice! For a free app, this program is still not a solid value. Buggy, frustrating and poor UI all equal a rough overall experience. I heard people paid $29-$49 for this? Yikes, I would have felt ripped off. I bought this for $50 hoping it would be a big help for my kids working on vocalic /r/ as I’m a speech path. It wasn’t helpful.